I certainly do NOT want a president who ignores issues and requests for information. She could have simply said the transcripts were not available to the public. She is a follower not a leader. We need a leader at this point in history. I will be voting for Bernie Sanders as I believe he is the ONLY one who can lead us back to a healthier democracy. I completely agree, Nancy. 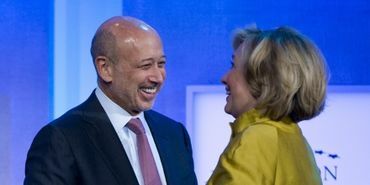 The fact that she could find anything to laugh about regarding a question about the Big Banks in this country shows she is totally out of contact with the reality of the man or woman on the street! She is consistent in one arena-fabrication. That was immensely evident in the lies she told about Bernie at the recent debate as he used his time to explain (past known) facts rather than move forward. As strong as she seems, I agree with Nancy that Hillary follows (big everything) as a recipient of mega bucks from lobbying corporations. Change will only happen with Bernie. Never have trusted this woman. Seems to be? She is showing her true colours. For your country's sake, Bernie better win. So far, polls show that Bernie's ahead in IA and NH. Hillary's running scared now. That makes her desperate. And, she still seems too sure of herself. I'm afraid she's collecting Super Delegates. I'm not sure how they play, or if her tactics will work; but I'm hoping that the Sanders campaign is prepared to do battle within the party if/when this becomes necessary. Will she bow out gracefully.....or will she do damage? This U.S. election is sure a mystery. I'm so glad that here in Canada we only let the federal elections run about a month or so in most cases. Unfortunately, the last one we just had ran for about three months which, I think, was the first time in our history. Though our political system is so different than U.S. so that helps. Our election is unfortunately a high-priced spectacle, as corporations and the elite purchase the candidates. The media cash in big time on all this, too. Ordinary people pay the price in worsening inequality and an ever-declining standard of living. Hillary could only come up with some flimsy rationalization at best for why she's in bed with the Banksters, so why not just laugh it off? She obviously doesn't give a damn. Hillary is a highly intelligent woman, who during her husband's Presidency help turn around some issues through Bill. Now, she's caught up in the big money and it's going to be her downfall. Do I think she's capable of running this country? I sure do. Will I vote for her? Probably not unless she has Sanders as her running partner. I truly don't think Bernie has been tainted by the political machine and really wants to turn the country around. I hope he wins the Primary. As Seth Meyers said--she smiled so widely that her ears touched in the back of her head. Ty Judy. Noted.